Random.org picked 40! That means that LeilaMac over at (in the tweeds) is the lucky winner!! 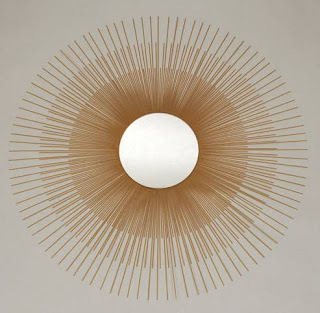 Her choice was the beautiful Gold Sunburst Mirror. To each and every person who entered: I wish I had lots and lots of prizes to giveaway because I would give something to each of you for being so fabulous. Thank you for taking the time to enter the contest and comment on my blog when you do. The fact that I have as many readers and followers as I do is still surprising to me and I am truly grateful for all of you!! That is too funny about the nail heads post! I love them and make everything look so elegant and fun! Cannot wait to see your post on them. Hey- we should plan a Boston women bloggers meet up. A bunch of people have emailed me since moving here. I know they do it in NYC and in Salt Lake.I think the group is called BlogHer.